All caught up in trying to be a man, I’ve forgotten what it’s like to be a boy. 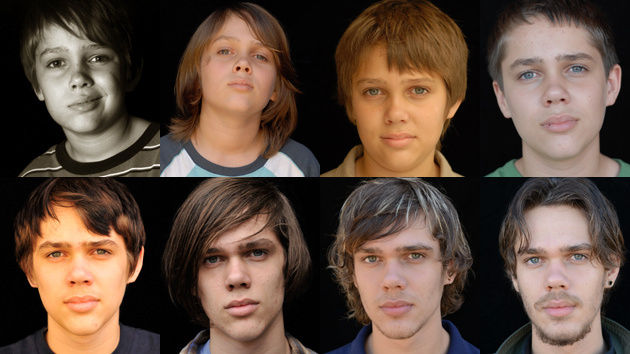 Just recently I saw the movie “Boyhood”, directed by Richard Linklater. The movie is amazing and unique in the fact that it was shot over the course of twelve years using the same young actor, from age six to eighteen. The other actors, especially those playing the part of his older sister, mother and biological dad, also committed to the project for twelve years. This gives the whole experience a continuity and realism that most movies can’t come close to duplicating. I was impressed at the seamless quality of the narrative as one era of the boy’s life flowed into the other. Over the course of two and a half hours I watched him grow up before my eyes. It was a fascinating form of cinéma vérité. Yet despite all that, I found the movie to be depressing. So much so that it has weighed on my mind for a few days. There were many things about the film that brought me down: the context of a broken family, the ubiquitous alcohol and drug abuse by adults and teens, the shallowness and narcissism of so many of the characters, and the hyper-sexualized environment of the modern world. But those things, in and of themselves, are not unique to contemporary movies or story-telling. What weighs heavily on my mind after seeing the movie is the sense that I was watching a tragedy unfold; and that tragedy was boyhood. A “tragedy” in the traditional sense is the story of the downfall of a great man. The classic Shakespearean tragedies like “Macbeth” and “Othello” come to mind with this definition. Like having to look at the car wreck by the side of the road, we can’t help but gawk at a tragic story as we see the pieces of someone’s life come apart. It can be a gripping way to tell a story and a very sad way, too, as we all realize the possibility of a life being taken from something good to something awful through choice and circumstance. It is agonizing to watch a life unravel, feeling that you can’t do a thing to stop it. 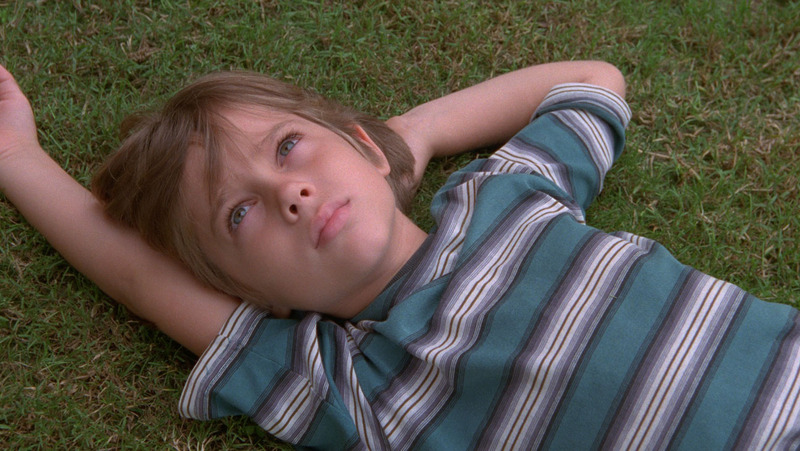 As I watched “Boyhood” I felt like I was watching a modern take on the form of tragedy. I was watching a good life, the life of a boy, being dragged inexorably towards something awful: Manhood. Being a man, as depicted in the movie, felt less like a destination for the boy than it did an inevitable and depressing end. This feeling came about due to the three main “role models” that appeared in the life of this boy. Each was a father-figure and each had ugly masculine baggage attached. The first was his biological father who fit the mold of the cool, hip dude who is not at all ready to be a dad. He is the classic Man-Boy who seems perpetually unemployed and allergic to responsibility. He is not there for the early years of his children’s lives, leaving them in the care of their single mother who is understandably portrayed as tired, overwhelmed and doing the best that she can. As the movie progresses, he shows more interest in his kids and grows up somewhat, but he appears in their lives sporadically and creates a new life and family for himself with another woman. He’s both important and not important to his children. He’s both Dad and Deadbeat; available when it fits his schedule, floating in out of the lives of the children he brought into the world. The second was the boy’s first step-father, a professor who his mother marries as she pursues a path of gaining education to better care for her family. There is financial and logistical stability introduced through the character of this man. But from the outset he is portrayed as controlling and bullying; a man who micromanages his kids’ lives and humiliates them publicly. Worse than all this is his alcoholism which leads him to physically abuse the boy’s mother and threaten the safety of the children. In one painful scene, he drunkenly accosts the family assembled around the supper table. Turning to the boy he says, “You hate me don’t you? That’s okay, I hate me, too.” He is the Man-Monster; the messed up abuser who despises himself and takes it out on those closest to him. The third father-figure of the movie is the mother’s second husband. He is a veteran of Iraq and Afghanistan, pictured initially as idealistic and caring. He brings a sense of true stability as he seems to be honestly intent on giving the woman and her then-teenaged children a home and place to belong. Yet as the time goes by, he seems to slip into a depression. Life for him looks like an unpleasant treadmill; he has a dead-end, unchallenging job which doesn’t make enough money to drive his desire to be that man that supports his family. He becomes cynical and angry, drinking too much and spitting out criticism at the boy and his lack of responsibility and gratitude. He is the Frustrated-Man; starting out full of ideals and ending up an empty shell. Each of these father-figures was once a boy, too. Boys with potential and energy and talent. But implied in the narrative of the movie was the fact that each was deeply flawed, likely due, in part, to the poor role models they themselves had while growing up. Herein lies the depressing thing for me as I watched the story play out on the big screen: the boy was becoming a man but there was no sense of hope that his life would be any different than the three men who played the most major role in his upbringing. The story ends with him entering college at the age of eighteen but the question of what kind of man he would become is left hanging in the air. Based on the evidence of manhood displayed in the rest of the movie, things seemed very bleak. Would he grow up to be immature and rootless? Cruel and hateful? Cynical and frustrated? If there was another way, that way was never shown or even hinted at in the story. That was why I left the theatre with the dark feeling that I was watching “The Tragedy of Boyhood”: that each boy becomes a man and that spells the end of the promise of youth and the beginning of a path littered with bad choices, destroyed relationships, shattered dreams and a vast emptiness in your soul. I am the father of a seventeen-year-old boy. Actually, he’s really a young man, not a boy anymore. As I let the movie sink in, I couldn’t help but think of my son and of myself as his dad and main male role model. I also couldn’t help but think of ways I could see myself in the father-figure characters of the movie. In my manhood I have felt frustration, hopelessness, emptiness, anger; I have felt the self-loathing and the cynicism. At times I want to chuck all the responsibility out the window. At other times I feel overwhelmed with it all: the weight of supporting a family, the job of being both a strong partner for my wife and a strong guide for my kids. What was it like being a boy? Sadly, I find that I can hardly remember anymore. Manhood is heavy and seems to conspire against the boy in each of us, driving him out. I know many men who are far more serious, terse, task-driven and unhappy than they ever were as boys. What is worse, when we become men and fathers we seem to think it is our duty to drive the boyhood right out of our sons. The father-figures in the movie were obnoxious in their giving of unsolicited advice. At times the boy was made to feel small and insufficient by the very people who are there to make him feel strong and valued. Instead of enjoying the opportunity to be a dad, they seemed intent on “making a man” out of him by squelching everything that made him a boy. This has weighed heavily on me because I don’t want to be this kind of father-figure for my son. But I fear I have been guilty of some of the dysfunctional attitudes and actions I despised in the movie characters. I fear that I am passing on to my son the sense that boyhood is a tragic story leading to an inevitable end. I want so much for my son to see that becoming a man does not have to mean losing your boyhood, your potential, your dreams, your hopes, your self. The movie has made me rethink what kind of example I am setting for him; what kind of path I am laying out for him to follow. Though I may feel the burden of being the husband and father, the Responsible Man, that is no excuse to lose what is wonderful about manhood and fatherhood; and it is no excuse to lose what is valuable and unique about myself. One of the greatest things about my life is that I have been given the gift of being a Dad. I have two incredible children who have been entrusted to my care. I have been called to do way more than provide support for them; I am called to love them, value them, build into them, walk beside them and encourage them in the time I have been given with them. What an awesome privilege. I can’t waste this time wallowing in self-pity and cynicism. I can’t waste my chance to be a Dad in selfishness, frustration and anger. The cost is too high and my children far too valuable. I’ve come to believe that only true boyhood can make manhood special. You can’t have one without the other. And I can only be the man I need to be by remembering the boy I was. And I can best guide my son to become a good man in the future by valuing the boy in him now. Truly, that would go a long way in taking the narrative of his life from inevitable tragedy to certain triumph. I cannot think of a greater gift to give him on his own coming-of-age journey.